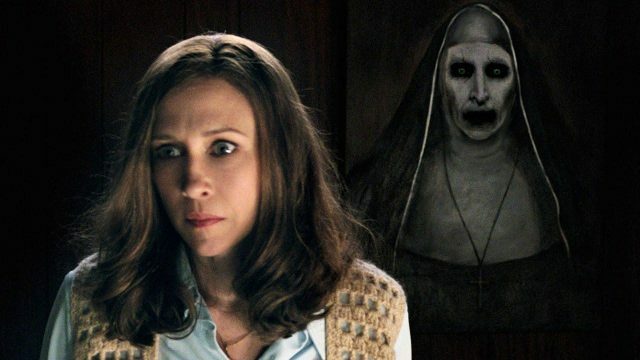 New Line’s Conjuring franchise is currently bursting at the seams with spooky stories – The Nun, The Crooked Man, and horror spinoff Annabelle: Creation are all incubating in various stages of development – and the studio is now ready to carve out the seventh installment in its interwoven universe: The Conjuring 3. Deadline has the scoop, confirming that David Leslie Johnson (Dungeons and Dragons, The Conjuring 2: The Enfield Poltergeist) has been appointed to hash out a script. He steps into a void left vacant by James Wan, who is busy helming Aquaman for Warner Bros. ahead of its planned release on December 21st, 2018. Granted, Wan will still be actively involved in the development of The Conjuring 3, and is expected to produce via his Atomic Monster banner. Since its inception three years ago, the company has become something of a hallmark of quality within Hollywood’s horror genre, and even helped foster David F. Sandberg’s cracking feature film debut, Lights Out. Incidentally, Sanberg has since been roped into the ever-evolving Conjuring universe, and is now directing Annabelle: Creation ahead of its launch on August 11th of this year. Meanwhile, David Leslie Johnson is coming off his work on The Conjuring 2, and we understand the esteemed scribe recently assisted in a rewrite for James Wan’s Aquaman. He’s penned multiple episodes of The Walking Dead, too, along with mythic blockbuster Wrath of the Titans and Red Riding Hood. No further details regarding casting and/or a release window were disclosed at this early stage, but rest assured, The Conjuring 3 is on the way. Annabelle: Creation, meanwhile, is in line to become the next spooky addition to New Line’s supernatural series, and it’ll loom over theatres on August 11th.